On March 17, the world will unite under a banner of green to celebrate St. Patrick’s Day, the Catholic feast day in honor of St. Patrick, patron saint of Ireland. St. Patrick was a Catholic bishop who spent 40 years working to convert the various Irish tribes to Christianity in the 4th century, according to Catholic.com. But the current incarnation of the holiday is a relatively recent development, according to an article on www.history.com . The 2011 version of the downtown Oklahoma City St. Patrick’s Day Parade is scheduled for Saturday, March 19. The parade will begin at 1 p.m., starting at 5th and Broadway to EK Gaylord, east on Sheridan into Bricktown. Quite a popular holiday event, the parade typically has thousands of Oklahoma City residents lining the streets. There will be more than 80 parade entries, Shriners, dancers, clowns, animals, antique cars and more. The 2011 Bricktown St. Patrick’s Day Block Party will be held Thursday, March 17. The outdoor festival is held on the streets of Bricktown, on the corner of Sheridan and Oklahoma Avenue, typically beginning in the early morning. There are green eggs and ham for breakfast from 7 to 9 a.m., and the party goes until midnight. Bring your lawn chairs, have green beer, listen to live music, and see authentic Irish step dancing. Admission is free and there are areas for kids as well. No coolers, cameras, weapons, pets or outside food or drinks will be allowed. Oklahoma River Cruises is offering a St. Patrick’s sunset cruise from 5:30 to 7 p.m. on Thursday, March 17th. There will be music, hors d’oeuvres, beverages and a limited cash bar. For more information visit http://okc.about.com/od/holidayevents/a/stpatricksokc . A free tow for your car and a free ride home for you are available from AAA Oklahoma if you think you’ve had a bit too much to drink at a St. Patrick’s Day party. AAA Oklahoma’s Tipsy Tow program runs from noon on Wednesday, March 17, until 6 a.m. on Thursday, March 18 in metropolitan Oklahoma City, Tulsa, Lawton, Enid, Ardmore, Shawnee and Muskogee. To call for Tipsy Tow, dial (800) AAA-HELP and ask for Tipsy Tow. AAA will provide a free tow and ride, no questions asked, within a 15-mile radius from point of pickup, for the vehicle and up to two people. In fact, the article states, the Irish government mandated that all public drinking establishments close on March 17 to show respect to St. Patrick on the day of his death. It wasn’t until 1995 that Ireland began to consider adopting the international image and traditions of St. Patrick’s Day as a way to drive tourism to the country. According to the Encyclopedia Britannica online, it wasn’t until Irish Americans began to use the holiday to proclaim solidarity and demonstrate the power of the “green machine” block of voters that the holiday began to be celebrated in its current form. 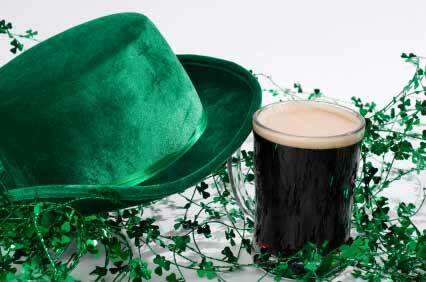 The “wearing of the green” and “green beer” traditions are also an American invention, said Britannica. Among the more unusual traditions surrounding St. Patrick’s Day in America is the dyeing of the Chicago River, said History.com.